When I first started my career as an SLP in the late 1970s, speech homework was a routine, but unsuccessful part of my therapy. Most of my caseload of 75 students were working on articulation goals. 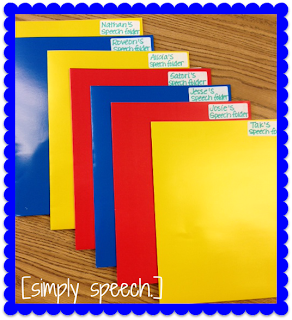 I had an accordion file with worksheets labeled by phoneme and at the end of each session, a worksheet was added to each student's folder. Only a handful of students regularly returned the folders and even less actually practiced the activities. Fast-forward to 1990 (and the next 20 years) and my caseload consisted of students in special education programs needing much intervention in the area of language. Worksheets would not suffice. 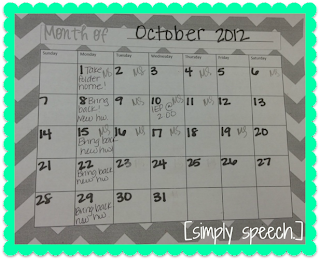 Below, I have described 25 speech homework activities to use with students in early childhood and elementary grades. I have used many of these activities, but have also posted some new ideas that might easily work - none involve speech folders. Scroll down to see my thoughts on packaging and returning homework. 1. For my Early Childhood Special Education classes, I sent home newsletters telling about current speech and language activities and providing suggestions for home practice. A similar idea, language at home, developed by Kristen at Heard in Speech, is a fabulous way to provide at home language enrichment activities for young students. 2. Presentation counts!! 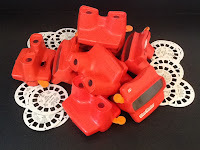 I found some cute Articulation Boxes at Speech Gadget - these would be easy to use as speech homework. 3. Legos - When my son out-grew his Legos, as all other toys, they were mine for therapy. Package some Legos in a small Ziploc Instruct the child to build something with the Legos and bring it back to tell you about it. Great for the /l/ sound (Lego, blue, and yellow), articulation carry-over, and good for a number of language goals. 4. Send home some old sequence cards or print some new ones. The child can put them in order and tell someone about the sequence. There are numerous sets of sequence cards at Make Learning Fun (search "sequence cards"). I saw cards for literature selections such as Go Away Big Green Monster, The Very Quiet Cricket, Chicka Chicka Boom Boom, Cookie's Week and many, many more. Find science related sequence cards such as Phases of the Moon and Sunflower Life Cycle. Others included hand washing, shoe tying, and nursery rhymes. 5. Let a student take a doll, stuffed animal, or plastic figure home for night. When it is returned, ask questions such as "Where did he sleep?" "What did he eat?" "Did he like his dinner?" "What toys did he play with?" 6. One of my students loved wearing a big sticker with "Ask me to say ______." written on the sticker. By the time he walked from the speech room to his first grade classroom, he had the opportunity to say that word or phrase at least five or six times. If the sticker made it home, even more opportunities. Highlight target sounds in an old book. 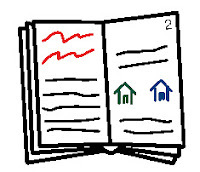 Send home a mini-book with pictures of target vocabulary (make this with PowerPoint). For families with Internet, suggest reading a book on-line. We Give Books, Kizclub, and Lil' Fingers are three of many sites with books and stories. Send home a "book in a bag" complete with question cards or story props. 8. Find great articulation board games at Adventures in Speech Pathology. Send home the game, buttons for game pieces, and a die. 9. Monthiers posted by Speech Lady Liz. 10. 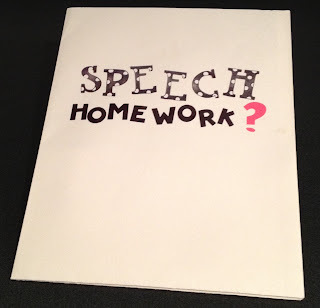 Speech Practice in a Box, Motivating Homework for Speech Practice. Posted by Deborah Adamczyk at Speaking of Speech.com (scroll down the page to find this). 11. Send home articulation pictures or other activities along with a puppet. The puppet should practice the homework. 12. For very busy parents, try the speech and language car activities found at North Shore Pediatric Therapy. 13. Find File Folder Games at File Folder Farm.com and Ms. Arnold's First Grade Class. 14. Memory, Snap, and Hide and Seek are a few of the many ways to make multisyllabic word practice fun at Play Talk Learn. These games could be adapted for so many goals. 15. Keep a journal. Write a note (or add a pre-printed note) as to what the student should do for home practice. Examples of tasks could be counting to 25 using good sounds, repeating a target word five times, finding six soft things, five big things, or finding four things that begin with a particular phoneme. You can ask students to tell about a picture, put attached pictures in order, or draw a picture and tell about it. This is also a great way to communicate with parents - a simple note such as, Emma put three words together to say "cat in box" today., is very much appreciated by parents. 16. Use the wonderful activity calendars at Preschool Express for toddlers and preschool students. 17. For parents with Internet access, suggest web links for stories, language games, and articulation practice. Check out my web page with links sorted by category. Or, if a parent has a tablet, suggest free apps. 18. Again, for families with Internet access, Teacher Tube and YouTube have some great videos. I searched for "speech therapy" and came up with many good ideas. My favorite was Doug the Dog Teaches About the Preposition "In"
19 . There are a variety of "flip" games on Pinterest. Find Pancake Flip at Speech Room News or download my version using eggs. Cut-out the eggs, glue vocabulary or articulation pictures on the blank sides, and laminate. Put the eggs face down on a table and as the child says the target words, he or she flips the eggs with a spatula. Package a small dollar store spatula, the eggs, and instructions in a large envelope or Ziploc. 21. Print and send home a craft activity from Kizclub. Don't forget to send home items needed such as a glue stick or brads. Include instructions for verbal interactions. 20. Turn old games or toys into activities to send home. How cool would it be to bring a fun toy home for the weekend? 22 Take a picture of the child doing something in therapy. Print the picture and send it home with instructions such as, "Ask your child to tell you _________ ." 23. Try craft stick activities. Find Silly Speech Sound Sticks and Artic Sticks at Sublime Speech or use the French Fry Articulation from Speech Room News. 24 Articulation /Vocabulary tubs - Put 5 or 10 small objects and/or laminated pictures into a tub representing the child's target sound or vocabulary words. 25. 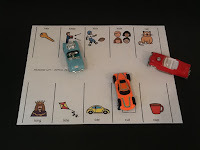 Laminate a Parking Lot Game and send it home with one or more vehicles to practice a variety of speech and language activities. The package can make your speech homework a little more appealing. Use old gift bags, tins, and interesting boxes. Old articulation cards on a ring or ribbon might get more results than a worksheet. Always add instructions such as "Please read this to your child and practice the highlighted words." "Ask your child to say these words using a good "s" sound." or "Ask your child to answer questions such as .......... as you read this book." AND, "Please return." or "You may keep this book." Early in my career, I asked parents to sign homework, but as my experience grew and I changed my homework methods, I didn't see the need. If the students were motivated by the activity, I knew that it would be used in some form. The students also knew that when one "cool" activity was returned, they would receive another. I can only recall losing one item (a book) during my 20+ years without folders. What do YOU use for speech homework? If you have Montell Jordan in your head now, we are totally on the same page :) Earlier in the school year I had a lot of questions about how I do homework folders. I decided to re-do my method this year and sent them home for the first time this week. This method is pretty simple and will (hopefully!) increase the amount of practice my students get at home. Each student has a their own folder. Each folder contains a letter from me, a calendar, and their homework for the week. -if the parent initials at least 3 times during the week, the student gets a treat! 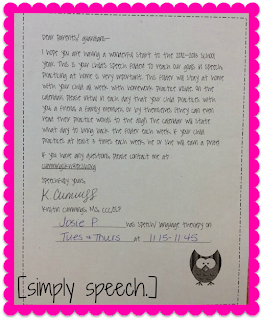 "bring folder to speech today"
etc.... this is a great communication tool with parents! So that's it! Short, simple, and sweet... Let me know your thoughts!